First stop, a WHL favourite, Achillea Flowers on Mill Lane. 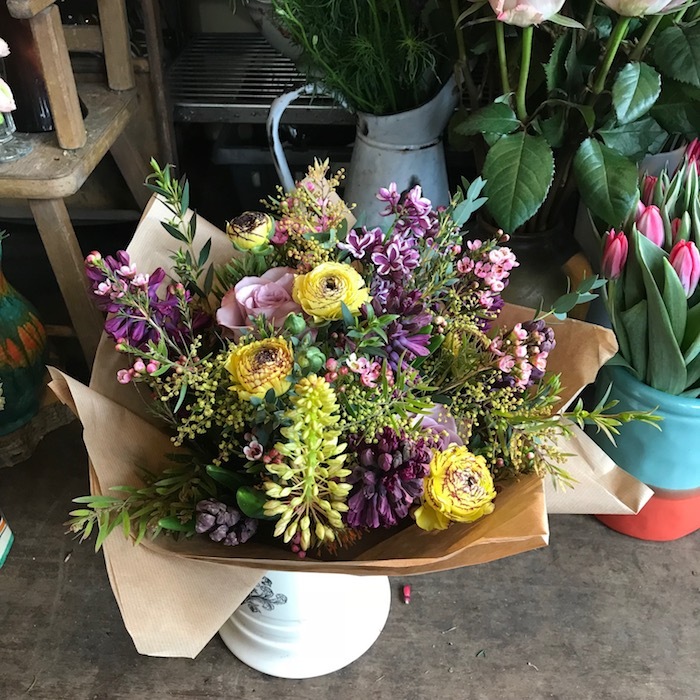 It has its usual array of really beautiful bouquets of course, but for something a bit more special how about getting your mum a place at one of its workshops? Next up is “Dressing the table for Spring” (£100 with £5 off if you mention WHL) on 20th March. This includes all materials (and wine!) so your mum will come away with a beautiful table display and lots of ideas. 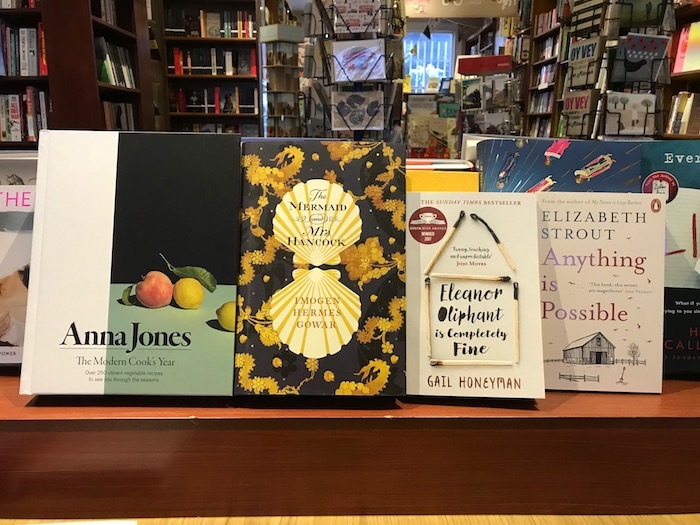 West End Lane Books suggested the latest novel by Elizabeth Strout, ‘Anything is Possible’, or Elinor Oliphant’s ‘Everything is Fine’. Fans of historical fiction might like ‘The Miniaturist’ (televised over Christmas) or ‘The Mermaid and Mrs Hancock‘. For something a bit more emotional, the shop has signed copies of Greg Wise’s book, co-written with his sister Clare, who died from cancer in 2016. If it is a cookbook you’re after then I liked the look of Anna Jones’ ‘The Modern Cook’s Year’. Just the right weather to curl up with a good book! 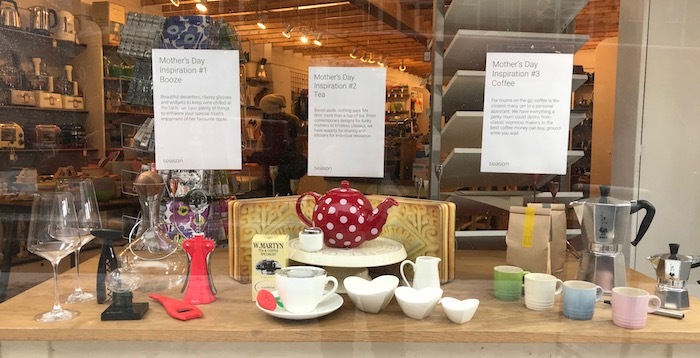 Season Cookshop has done all the hard work and, in a very helpful window display, made suggestions for the tea, coffee or wine-drinking mother. It also stocks Artisan du Chocolat’s delicious sea-salted caramels. I know, I know, salted caramel is as ubiquitous as a Keep Calm apron, but Artisan was one of the first to combine them and still one of the best. Tea, coffee or … wine! For more chocolate options head over to Zyla on Broadhurst Gardens where Zoe has a delicious selection available. 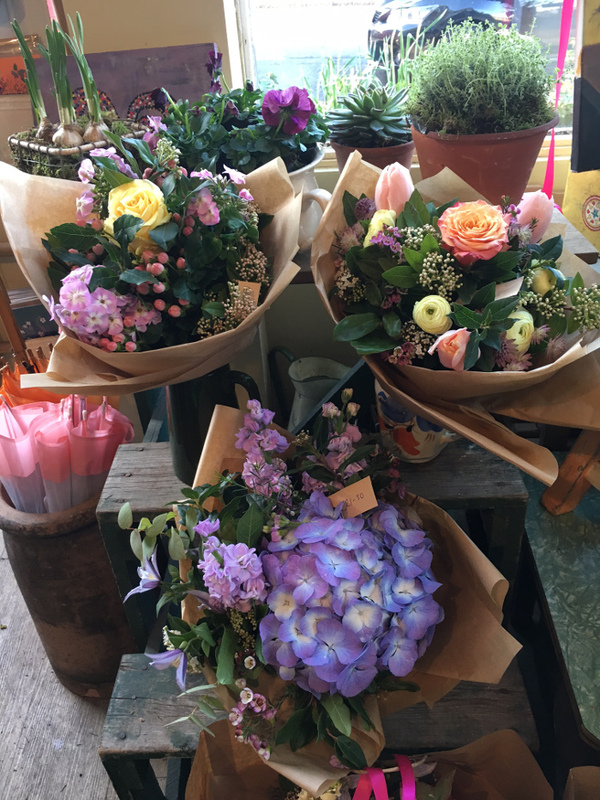 She is also offering a Mother’s Day basket, which includes not only her chocolates (and I think a candle by local candle maker) but also a suitable book from… West End Lane Books (of course)! And finally, if you are looking for something creative and ‘crafty’ try the Village Haberdashery. 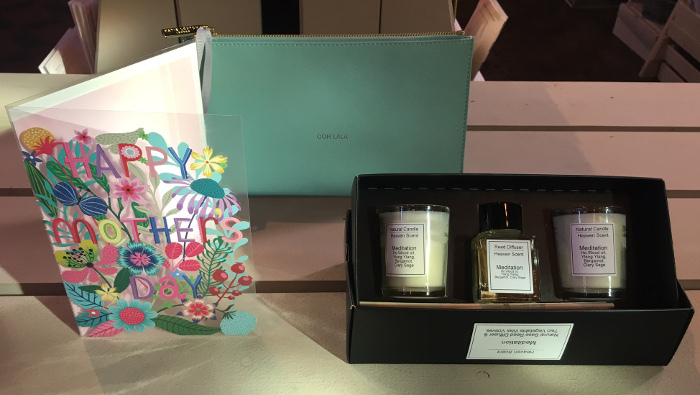 It has put together a selection of nine Mother’s Day present ideas. 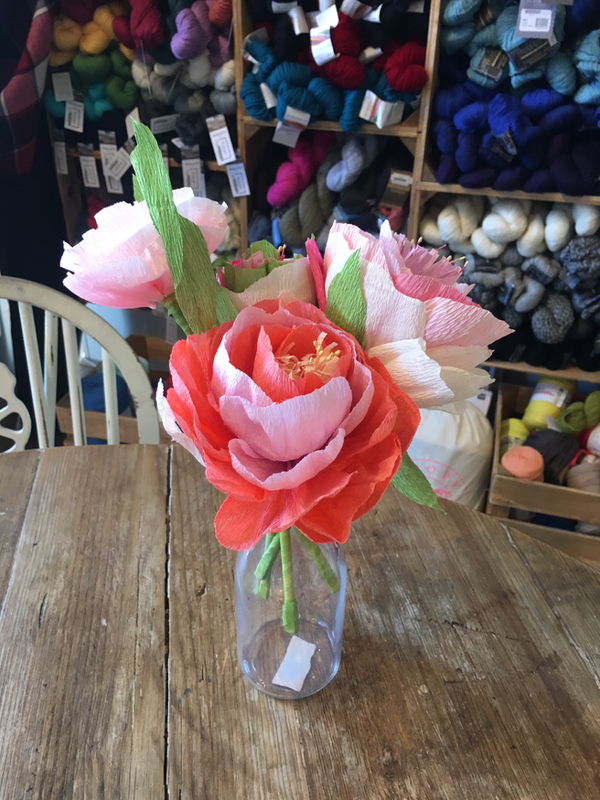 Plus on Mother’s Day itself, Annie will be popping prosecco and hosting a free paper-flower making table at the shop. No booking required – bring your mum, bring your kids, just come and relax. Mother’s day or Mothering Sunday, is the 26th March. Which is soon. If you haven’t got something for yours, or for younger mums something ‘from’ the kids – what to buy? WHL scooted round the shops in the ‘hood – and this is what caught our eye. 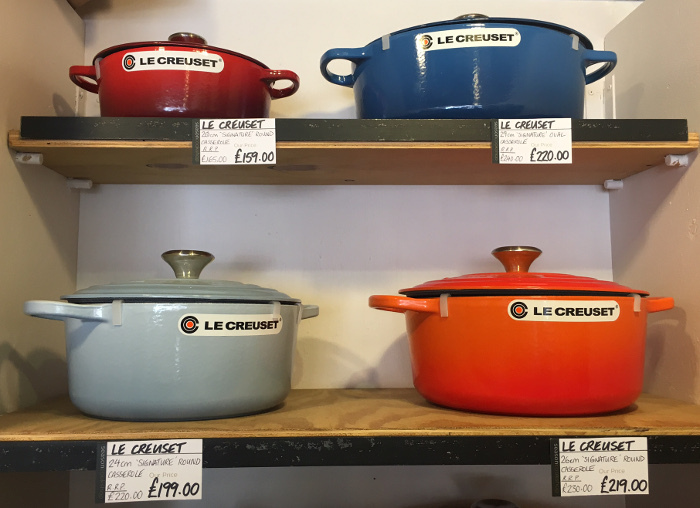 Season’s Cookshop said “well it depends how pleased you want to make your mum!” and suggested a Le Creuset casserole dish (priced from £99 to £219). Or for the perfect coffee with the right crema a Bialetta coffee maker (£36.30 with 20% off at the moment). Otherwise, although your mum might take this the wrong way I quite liked the ‘avocado shark’ – a kitchen tool for avocados. My heart belongs to … cocoa-dusted walnuts, or possibly chocolate salami. 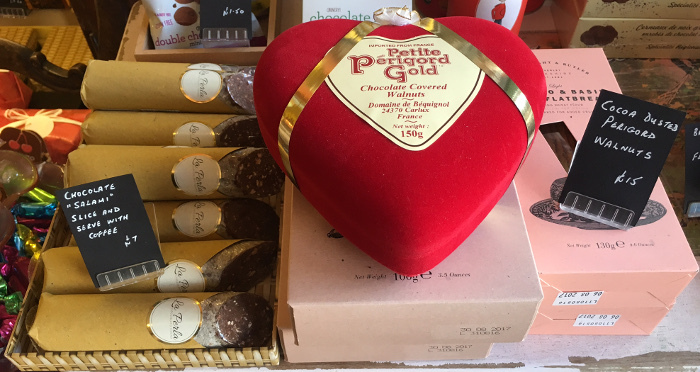 Sticking to the food theme, down at Cocoa Bijoux on Broadhurst Gardens they recommended their cocoa-dusted Perigord walnuts at £15 or a selection of home made truffles. Otherwise Selma who was running the shop that day (Stuart the owner’s mum and from South Africa), would like some of their Biltong, but not sure my mum would be that chuffed. Can’t decide? Get all four. 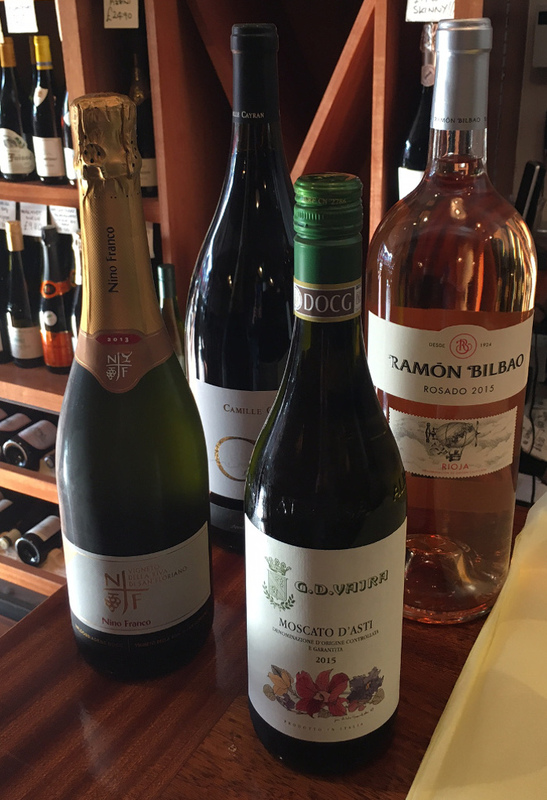 If wine is more her thing then Avie at Tannin & Oak suggests maybe some vintage prosecco by Nino Franco at £25 a bottle, or a white frizzante Moscate D’Asti at £16.00. For something with a bit of a wow factor he also has magnums, recommending a rose – Rosado 2015 by Ramon Bilbao at £19.99 or red for £30.00 from Camille Cayron. 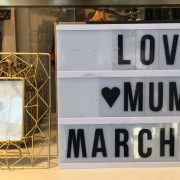 Andrea at Vini Vici on Mill Lane was a bit more cynical about Mother’s Day, but happy to make a recommendation if you pop by. 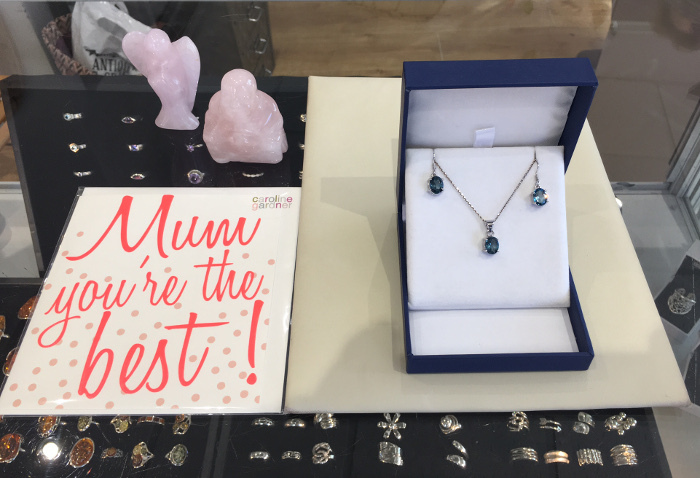 North West 6, the gift shop by the tube station offers jewellery – recommending this blue topaz set for £240. It also has range of semi-precious stones (their healing powers are all the rage in L.A. at the moment) so maybe a rose quartz buddha or angel (depending on her religious viewpoint)? They also have a good range of oh-so important mother’s day cards. Is she a cat or a dog person? Something for the younger artier mum? 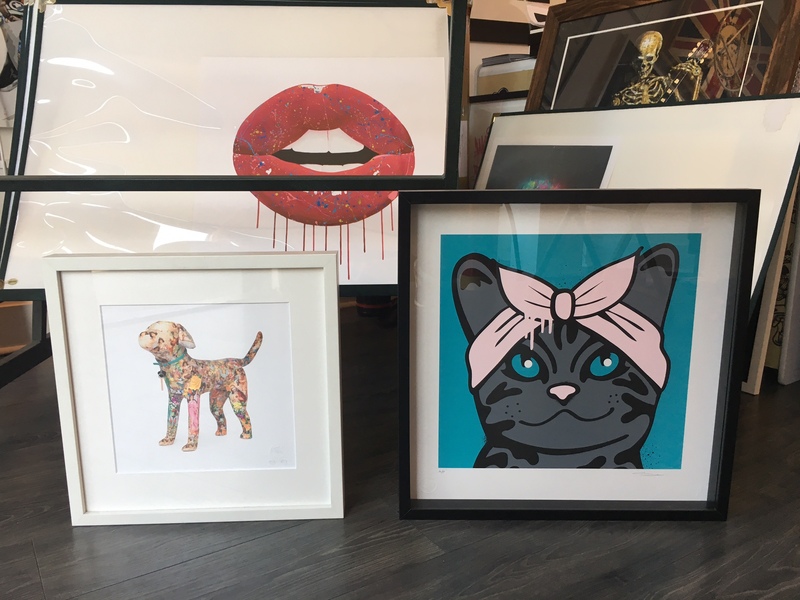 Try Monsters of Art on Mill Lane. Is she a cat or a dog person? Two pictures that caught my eye are these. The cat (£175) is by a local (well, Cricklewood) artist. The photo doesn’t really do justice to the dog picture (£300) – I really liked it, as did a well-known (and cool) DJ who’s already got a couple. 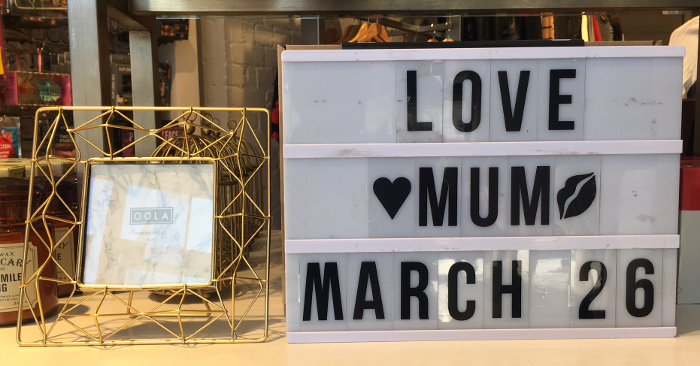 Two other options for the younger mum (or young at heart) is Joy which offered this nice picture frame (£12.00) and La Boutique Secret. Both had lots of fashion options but it’s a tricky one, not only does the piece and colour have to be right but the size too. Easier for woman to choose than a man methinks. Perhaps a pampering present would be perfect? On West End Lane, Healthtown are offering a Mothering Sunday massage voucher for £50 (normally £60). Nearly opposite Nailsuite UK are offering a mani/pedi voucher for £40 (normally £55). As does Beauty Blossom on Mill Lane also £40 (that’s their normal price). Still looking for a card? The Sherriff Centre is another good source, and probably had the best card I saw (in the picture). As for presents it has some reasonably priced clutch bags by Holy Chic at £9.00 – or natural candle sets for £15.95. Ever popular are their individual letters at £1.75 each; so you can spell it out. Literally, another option is West End Lane Books. Danny had several excellent recommendations; something from the display of gardening books in the window? 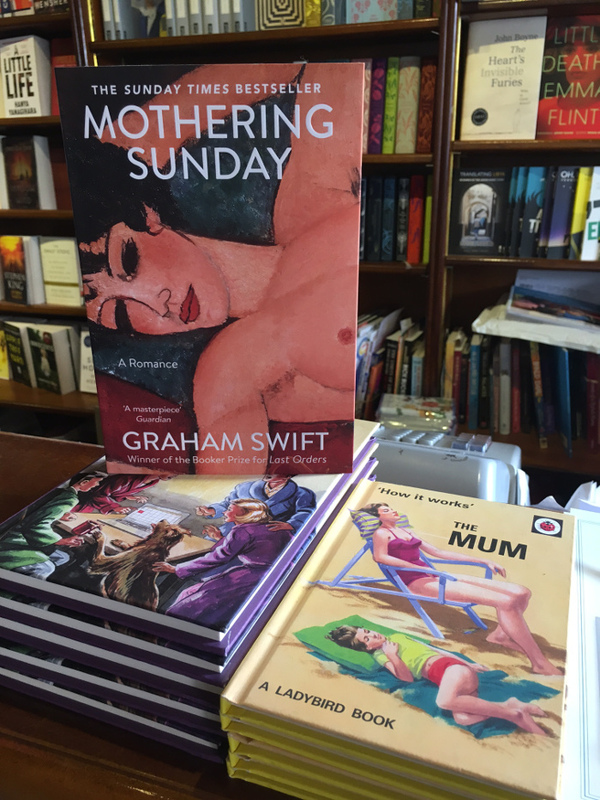 Shelves full of Persephone and Virago books or ‘Mothering Sunday’ by Graham Swift? A little lower down the literary scale they offer ‘The Mum – how it works’, or ‘Adrian Mole – The Collected Poems’. Say it with flowers, paper flowers! The Village Haberdashery has plenty to offer, suggesting cute crochet and knitting kits (£25 to £39). 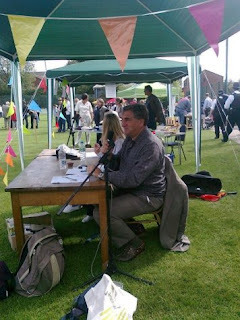 They also offer vouchers for their in-house workshops (£60) or paper flower making kits (starting from £5). Another handmade option on West End Lane is to take the kids (or just yourself) and paint a mug (£18) or a plate (£18 to £30) at Art for Fun. But better get your skates on as it has be done this weekend since it takes a week to fire, so ready for collection next Saturday evening. In time for Mothering Sunday, just. 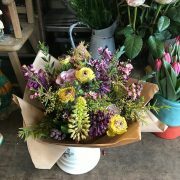 If it is real flowers you are looking for then for my money, or should that be for my mummy, you can’t go wrong with a bouquet from Achillea flowers (from £20 upwards). So there you are – at least twelve suggestions for a mother’s day present on your doorstep. If she doesn’t get anything, can’t say it was because you couldn’t find anything locally.